Recognizes a protein of 75 kDa, identified as mu heavy chain of human immunoglobulins. Recognizes a protein of 75 kDa, identified as mu heavy chain of human immunoglobulins. It does not cross-react with alpha (IgA), gamma (IgG), epsilon (IgE), or delta (IgD), heavy chains, T-cells, monocytes, granulocytes, or erythrocytes. 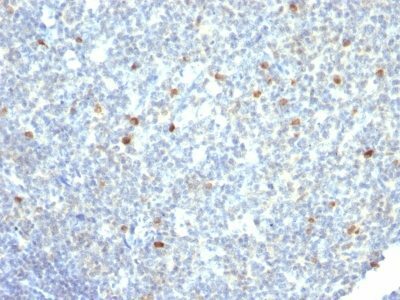 This MAb is useful in the identification of leukemias, plasmacytomas, and certain non-Hodgkin’s lymphomas. The most common feature of these malignancies is the restricted expression of a single heavy chain class. Demonstration of clonality in lymphoid infiltrates indicates that the infiltrate is clonal and therefore malignant. Catalog number key for antibody number 0260, Anti-Human IgM Immunoglobulin (IM260) The prefix indicates conjugation, followed by the antibody number and size suffix.